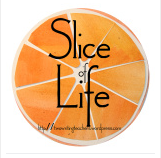 On Tuesdays, the writing community at Two Writing Teachers hosts the Slice of Life. Everyone is welcome to join in by writing, commenting, or just reading slices from around the world! I always enjoy days when I get to go to Teachers College, and last Friday was an especially good day there attending an day-long workshop on the Intersection of Author Studies, Interpretation Clubs, and Literary Essays. I went to the conference with a colleague so I didn't have to drive alone, we got out of New York before Storm Anna got in, and we both had a TON of new learning and resources to sort through, percolate, and share. 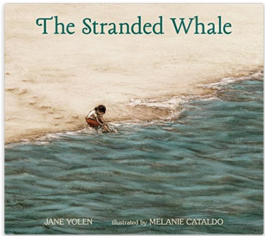 Then, when she read The Stranded Whale by Jane Yolen and illustrated by Melanie Cataldo (one of my favorite new picture books. Order it, borrow it, get your hands on it. So beautiful. I wrote about it yesterday in #imwayr.) we all were supposed to put a thumb up when we had a question about our category. I have to say, I listened to that story very closely because I was paying attention to repetition! Katie's suggestion was to assess students first so that you know what skills they are ready to work on; character work is more foundational than the understanding of tension and themes. Therefore, for students who may be struggling more, have them be on the lookout for ways they learn about characters' emotions, traits, relationships, and conflicts. Stronger students could be responsible for asking questions that deal with issues, lessons, morals, and ideas that lead into themes. Students are much more apt to listen closely and take the important work of read-aloud seriously if they are put in these sort of leadership roles within their own learning. If you can ever get to a workshop at Teachers College, I highly recommend them. The Saturday Reunion is now on the calendar for March 19, 2016. I try to write a post after workshops--I never leave without feeling inspired. So many smart people working together! This is a really great idea! Thanks for sharing it (and the book title as well). I wish I could get to a workshop there, but will have to settle for the great ideas you and others share, Melanie. I'm glad you got back home before the storm came in. What a day into the weekend. Love this lesson you shared. Roles for read aloud....and I've got a new picture book recommendation, now, too. Thank you. So happy I stopped here! Thank you for sharing wisdom from your learning day! I will try the strategy and check out the book. I recently signed up for the March 19th event. I have always wanted to get to Teachers College. Now, I am positively BURSTING with excitement about the learning opportunities that await! Thank you for your slice! I just came across your blog and love the entire section on ideas for interactive read alouds! I teach 7th grade and interactive read alouds are relatively new to me...I've always done a more traditional read aloud where I read and students just sit back, relax, and listen. I've been on the look out for more ways to engage students during the read aloud time, and I love the idea of putting the ownership for asking questions on them! I also like that this could be easily differentiated for some of my struggling students, depending on what lens you ask them to focus on. Thanks for the great idea!